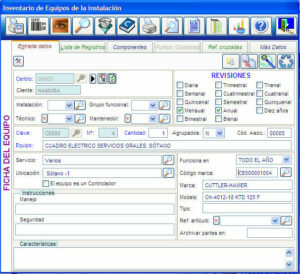 Is one of the favourite software for maintainers and managers of buildings, it is characterized for being renewed continuously. It is one of the most popular MovilGmao connections since, the software, has a large number of clients, most of them nationally recognized buildings that house public institutions, hospitals, hotels or universities. Mantedif is characterized for being a live program that includes almost daily updates and updates given by its main customers: maintainers and end customers to which different needs arise in their daily work. MovilGmao is a great improvement for Mantedif as it far exceeds the performance of the oldest application for pocket PC, such as the addition of photos and other files to an WO, stock control when a material is used in a WO and the creation of an inventory of assets from the mobile. The most popular functionalities of this software and 100% compatible with MovilGmao are: QR code generator for the identification of assets, linkage with barcode reading devices, very useful for the realization of inventories or checking furniture in different buildings. From the help desk of Mantedif it will be possible to close both corrective and preventive parts, add materials to the WO … another of the most useful features of Mantedif is the use of QR codes that are generated from the software itself for the control the presence of technicians in equipment and assets; You can also add documents such as photographs or pdf documents to the work parts to better detail the activities carried out or to be carried out. Mantedif also offers its customers an online support and training system through the free TeamViewer tool.